The MultiStomp MS-60B, Zoom’s versatile bass effects pedal has just been given a firmware update. Firmware Version 2.0 adds 84 new effects in addition to the 58 effects the MS-60B already has. 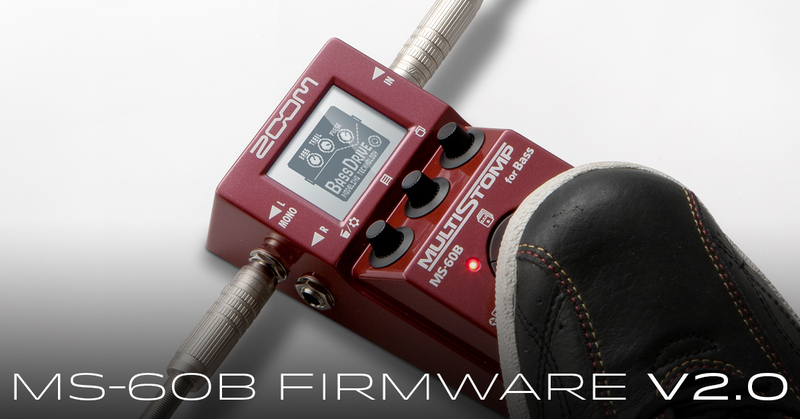 Firmware Version 2.0 opens up a variety of playing and music-making possibilities. It offers bassists famous amp models like SWR SM-900, Ampeg B-15, POLYTONE MINI-BRUTE III, Marshall SUPER BASS, Gallien-Krueger 800RB and EDEN WT-800. There are also new stompbox effects that include ORANGE SQUEEZER, ROSS Compressor, FUZZ FACE, BOSS CE-1, MXR M-117R and Electro-Harmonix SmallClone. For further information of effects available on the MS-60B, please refer to the MS-60B V2.0 Effects List (PDF).